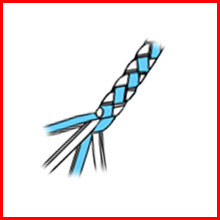 Lanyard Stitch is also Known as the 4-Strand Round Braid. 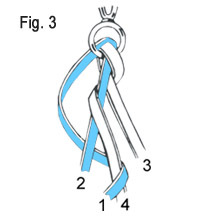 Two 1 yard (.9 m) strands of Rexlace = 1 foot ( 30.5 cm) length of stitches/knots. - Two 1 yards (.9 m) strands of Rexlace or S'getti String in contrasting colors. Fig. 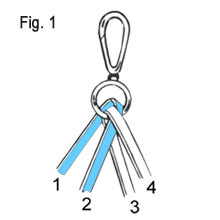 1- Fold both strands of Rexlace (or S'getti) in half and to find the centers and line the centers of the Rexlace stands on a key ring or lanyard snap. Overlap one color over the other, as seen here (like colors should be parallel). To make things easier, number each strand on the cords so that you can see the pattern of each stitch. Fig. 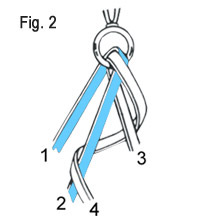 2- Starting with the end strand, (#4,) fold this behind strand #’s 3 and 2, and bring it in front of strand #2. Fig. 3- With strand #1, bring this behind strand 2 and 4, and fold it over strand #4. Fig. 4- Repeat steps 3 and 4. Continue this pattern until you have achieved the desired length. 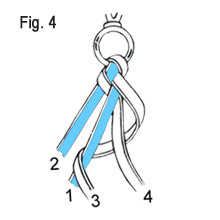 To finish, tie off with an overhand knot. Trim the ends leaving a small tail so that the Rexlace will not unravel.